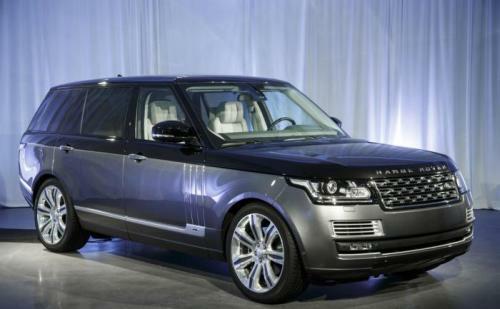 Land Rover has introduced the Range Rover SVAutobiography at the New York Auto Show. Created by JLR Special Vehicle Operations, the range-topping model is distinguished by a Graphite Atlas and polished chrome grille, revised "Range Rover" lettering and a four-tailpipe exhaust system. The model can also be equipped with an exclusive Duo-tone exterior that features a Santorini Black upper body and a contrasting lower body in one of nine different colors. While the exterior changes are relatively limited, the cabin is elegantly equipped with premium leather upholstery, wood trim and solid aluminum accents. There's also a luxurious rear passenger compartment with power deployable tables and a refrigerator - among other things. If that's not luxurious enough, the model can be equipped with a sliding rear load floor which features aluminum and wood flooring. There's also an "Event Seating" package which two Windsor leather seats that can be mounted on the rear tailgate. Power is provided by a supercharged 5.0-liter V8 engine that develops 550 PS (404 kW) and 680 Nm (501 lb-ft) of torque. It enables the long-wheelbase variant can accelerate from 0-60 mph in 5.5 seconds before hitting a top speed of 140 mph (225 km/h). In Europe, the model can also be equipped with either the SDV6 Hybrid or SDV8 diesel engine. The Range Rover SVAutobiography will go on sale this summer and UK pricing starts at £148,900. A U.S. launch is slated for this fall and pricing starts at $199,495.